The Seifert prague has many attractions that are nearby, some of which are within walking distance, while others may require the use of public transportation. A few of the popular sites near this Prague hotel include Wenceslas Square, the State Opera House, Prague Castle, and Olsany Cemetery, which holds the grave of Franz Kafka. 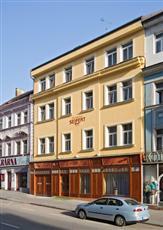 The Hotel Seifert Prague is one of the most conveniently located hotels in the city. The hotel is close to the shopping centers, as well as the airport and various modes of public transportation. The 30 rooms found at The Seifert Hotel Prague offer many of the modern amenities that guests have come to expect from contemporary hotels. Some of the amenities include satellite television, direct dial phones, a mini bar, a hairdryer, an in-room safe, and an Internet connection. Located near the city center of Prague, The Seifert Hotel Prague is close to many historic areas as well as the airport and the shopping district. Convenient public transportation allows visitors to travel to many of the most popular sites and attractions around the city.